Dr. Mike Woo-Ming | The Marketing M.D. 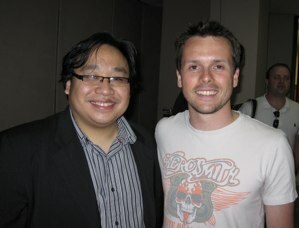 When I first started to watch Dr. Mike Woo Ming (www.themarketingmd.com) he was teaming up with Howie Schwartz on a whole range of products including Infosweet, Web2Secrets, TheOutSourceCode, LeadSupreme, Adsense Immersion and Traffic Tactics. He’d also had a few ‘run ins’ with Frank Kern… as they both tried one-upping each other (click here to see one of my favourites). What I admire most about Dr. Mike is that, unlike many internet marketers, he has built an amazing business in countless niches outside of the internet marketing space. In fact he has 80+ info sites that started out using the ‘Under Achiever’ business model. He then took many of these sites to new levels, ‘going deep’ within these niches. Pretty impressive! Downloading the skype MP3 took a lot of time but it was worth it. I’ve learned a lot of things.